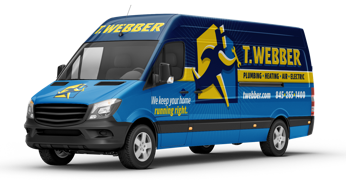 Hot Energy Savings Advice for the Cold Winter Ahead - T.Webber Plumbing, Heating, Air & Electric. As a family-owned home services company rated A+ by the Better Business Bureau, we know that Hudson Valley winters can take a toll on utility bills, and we are offering advice to help area residents maximize savings throughout the season. Check for air leaks – Window sills, door frames, and thresholds, and garage doors are all possible sources of drafts and leaks. Weathering stripping, especially as it ages, can be more susceptible to cracking and becoming brittle during winter temperatures. It is a good idea to check all stripping to make sure it is still securely attached and not allowing light to pass through any gaps. After checking the weather stripping, make sure the door lines up correctly with the threshold. Typically, the threshold can be easily adjusted by using the visible screws along the top plate. The door needs to rest over the top, not allowing light to pass through, but it does not need to drag roughly over the plate. The caulking around window sills needs to be checked for gaps as well, and garage doors may need to be realigned in order to prevent any air leaks at the bottom. Use the sun – Even during the heart of winter, the sun is still a great, free source of energy that almost every homeowner can utilize. During the day, make a habit of leaving the blinds open to allow natural light to enter the home and help provide some warmth. Opening the blinds on windows on the south-facing side of the home, when applicable, will allow the most light and warmth to enter. Lower the water heater temperature – The water heater is one of the most energy consuming appliances in the home, and many are set at the manufacturer’s default setting of 140 degrees. Lowering the unit to run at about 120 degrees can result in a lot of savings throughout the winter. Invest in a programmable thermostat – When the weather turns colder, set your thermostat as low as is comfortable when you are at home and up and about. Reducing the heat setting by a few degrees when you’re sleeping or out of the house will help save money on your monthly energy bill.